Walk the inward path. Put one foot in front of the other, and walk at a measured pace that is comfortable for you. On the way in, focus on letting go of things you want to leave behind and releasing things that stand in the way of your spiritual journey. Pause when you need to. Don't focus on the center as a goal; be present in each step of the inward path. Spend time in the center. Take as long as you wish. You may stand, sit, kneel or lie down. This part of the journey is about being present to your inmost self and to the power of the divine. You may pray, journal or simply be open to the stillness. Respect the boundaries of others with whom you share this sacred space. Reflect on the journey. 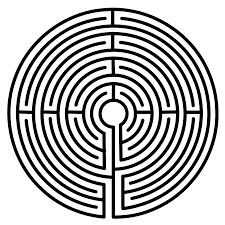 When you leave the labyrinth, you may pause make another gesture or say a prayer. Before leaving the area, take some time to reflect on insights you've gained, or make notes in your journal to explore further later.